Ras Abu Aboud (Arabic: راس بو عبود‎, translit. 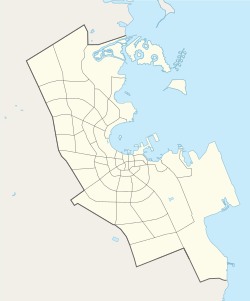 Ra’s Abū ‘Abbūd) is a district located in the municipality of Doha in Qatar. It is an industrial district containing power and desalination plants. It accommodates one of the three major power stations which supply electricity to the whole country. It is one of the proposed venues for the Qatar 2022 World Cup. "Ras Boo Aboot, the SE. boundary of Al Bidder Harbour, is in lat. 25° 17' N., long. 51° 35' E. The reef that forms the southern side of the entrance to Al Bidder Harbour runs out two miles from this point, and continues along shore, running off about one mile, until it joins Fasht al Anief." "Ras Bu Abut is a low point in the bay, 2½ miles W.N.W. from the last [Ras Abul Mashut]. Off it there is little reef, but between it and Abul Mushlit a great reef projects for 2 miles to the northward, forming the south side of the entrance to the harbour ; it is chieﬂy rocky, and has only a few feet on it at low water. The entrance to the harbour, north of this reef, is only one-third of a mile broad, for half a mile of its length, with 3½ and 4½ fathoms in it. 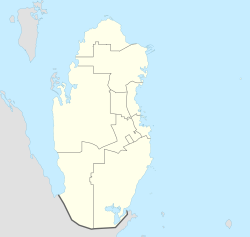 The northern reef projects to south-eastward 1½ miles, from a low sandy island with grass on it, called Jezirat as Suﬂa [Al Safliya Island]. This reef is chieﬂy of sand, and, outside the entrance, trends to north-east and northward, extending for some miles. Suﬂa Island is narrow, and about a mile long East and West; it bears N. by E. 3 miles from Ras Bu Abut. Within the entrance the harbour opens out into a basin about 3 miles in extent, with soundings from 3 to 5 fathoms, quite regular, over a bottom of white mud or clay." Inaugurated in 1963, the Ras Abu Aboud power station was built at a cost of QR 1 billion. It had a capacity of 60 MW in 1970, and an expansion in 1972 increased this to 90 MW. After several more expansions, by 1976 its capacity had been increased to 102.5 MW. By 1984 its capacity was more than doubled to 210 MW. In 1983, over QR 50 million had been invested in the desalination plant and it had a production of 11.5 million gallons per day. Environmental Affairs Department on Ras Abu Aboud Street. Information Technology Department Ras Abu Aboud Street. Technical Records Center, Oil and Gas Ventures Services Department on Ras Abu Aboud Street. Doha Distribution Center on Ras Abu Aboud Street. View of the Doha Corniche from the Marriott Hotel in Ras Abu Aboud. Ras Abu Aboud Civil Defense. Doha Sailing Club on Ras Abu Aboud Street. Sharq Village and Spa on Ras Abu Aboud Street. Marriott Hotel on Ras Abu Aboud Street. Housing Section, Human Resources Department of the Ministry of Municipality and Environment on Tabouk Street. Currently, the underground Ras Abu Aboud Metro Station is under construction, having been launched during Phase 1. Once completed, it will be part of Doha Metro's Gold Line. ^ The Report: Qatar 2012. Oxford Business Group. 2012. p. 83. ^ Qatar Labor Laws and Regulations Handbook - Strategic Information and Basic Laws. IBP. 2013. p. 165. ISBN 978-1438781501. ^ Mark Hobbs. "George Barnes Brucks and the First English Survey of the Gulf". Qatar Digital Library. Retrieved 8 February 2019. ^ G.B. Brucks, Robert Hughes Thomas (1856). "Historical and other information connected with place in the Persian Gulf". Bombay Education Society's Press. p. 559. CS1 maint: Uses authors parameter (link) This article incorporates text from this source, which is in the public domain. ^ The Persian Gulf pilot: comprising the Persian Gulf, Gulf of Omán; and Makran coast. Great Britain: Hydrographic Dept. 1890. p. 123. This article incorporates text from this source, which is in the public domain. ^ a b Whelan, John (1983). Qatar, a MEED practical guide. London: Middle East Economic Digest. p. 113. ISBN 0950521191. ^ Economical and Social Infrastructures in the State of Qatar. Doha: Al Noor Pub. 1984. p. 48. ^ a b c d e f g h i j k l "Qatar Landmarks". Ministry of Development Planning and Statistics. Retrieved 7 January 2019. ^ "QAR Metro". arcgis.com. Retrieved 17 March 2019. ^ "1986 population census" (PDF). Qatar Statistics Authority. Archived from the original (PDF) on 3 July 2015. Retrieved 2 July 2015. ^ "1997 population census" (PDF). Qatar Statistics Authority. Archived from the original (PDF) on 29 May 2015. Retrieved 2 July 2015. ^ "2004 population census". Qatar Statistics Authority. Retrieved 1 July 2015. ^ "2010 population census" (PDF). Qatar Statistics Authority. Archived from the original (PDF) on 2 April 2015. Retrieved 29 June 2015. This page was last edited on 24 March 2019, at 21:31 (UTC).